Hours after it was revealed that Special Counsel Robert Mueller is using a grand jury in the Russia investigation, President Trump stood before thousands of his strongest supporters nearly 300 miles away in Huntington, West Virginia. In the state Mr. Trump won handily in November, Democratic Gov. 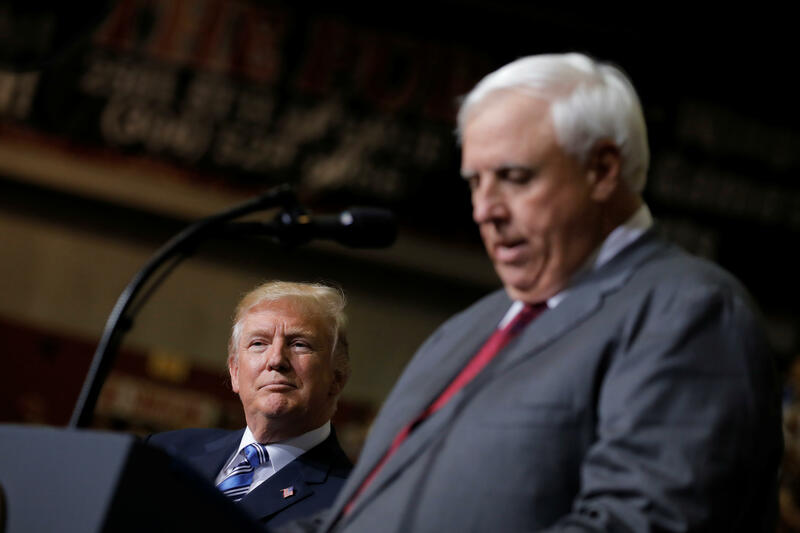 Jim Justice announced he is switching to the Republican party on Thursday night at the rally. Justice said the Democratic Party "walked away" from him, before defending the president on the Russia controversy. "Today I will tell you with lots of prayers and with lots of thinking," Justice told the crowd. "Today I tell you as West Virginians, I can't help you anymore being a Democrat governor. So tomorrow, I will be changing my registration to Republican." The West Virginia governor -- who seemingly took a shot at former White House chief of staff Reince Priebus by saying the country had a new chief of staff whose name people can pronounce in John Kelly -- sidelined the Russia story. "Have we not heard enough about the Russians?" Justice said. "I mean, to our God in heaven above, think about it! The stock market's at 22,000. And this country has hope, and we're on our way." Mr. Trump said the only reason Russia is a focus is because Democrats cannot accept his win. "We didn't win because of Russia. We won because of you," Mr. Trump said. "Have you seen any Russians in West Virginia or Ohio or Pennsylvania? Are there any Russians here tonight?" the president said. Instead, Mr. Trump said prosecutors should be focused on finding Hillary Clinton's 33,000 missing emails. The president has sternly and publicly criticized his own Attorney General, Jeff Sessions, for not going after the former secretary of state, even though Mr. Trump after the election told the New York Times he didn't feel strongly about the issue and didn't want to pursue charges against his former competitor. The president also touted his administration's desire to invest an additional $1 trillion in the nation's infrastructure, and curb the number of legal immigrants allowed in the country. Mr. Trump said he wants to prohibit immigrants from going on welfare for five years, a line he gave at a previous rally in Iowa last month. But that's already a provision in current law, something the White House said the president knew after that rally. It's unclear why the president repeated the line. As trouble swirls at home, Mr. Trump has taken to the skies and to the stage to speak to his supporters, blasting the "fake news" media, disparaging the "witch hunt" Russia investigation and touting his purported successes so far. Thursday's rally marked his seventh since taking office in January. As the president faces blowback on Russia, the GOP's failure to pass health care legislation before the August recess, and even leaked calls in which Mr. Trump admitted to Mexico's president that building a border wall was of secondary importance, he may need that support more than ever. At the rally, the president's daughter-in-law Lara Trump decired the "crazy story about Russia." "It's so crazy, you have no idea," she said. Mr. Trump visited West Virginia last week as well, when he touted his electoral college win and criticized his predecessor, former President Barack Obama, before the Boy Scouts of America at a national jamboree. The head of the Boy Scouts, Mike Surbaugh, issued a statement apologizing for the speech. Mr. Trump fueled even more controversy by claiming the head of the Boy Scouts called him to say the speech was the greatest his organization had ever heard. Later, White House press secretary Sarah Huckabee Sanders conceded Mr. Trump only spoke to members of Boy Scout leadership in person after the speech.